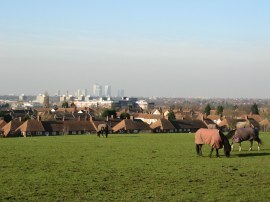 I did this walk on Monday 31st January 2011, immediately after having walked stage 5 which finishes at nearby Oxleas Meadows. 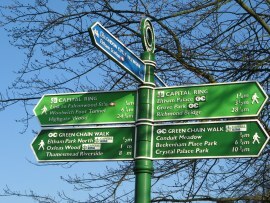 This stage shares its entire length with the Capital Ring, a stretch of path I had last walked back in February 2006. 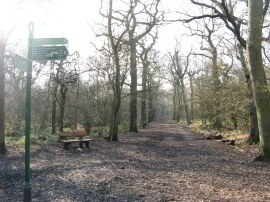 Stage 6 starts along a broad path heading through the trees of Oxleas Wood, photo 1. Reaching the end of the straight section the route heads to the left and then curves round to reach the Rochester Way, close to a small pond which was still covered with a thin film of ice, despite the bright sunny weather that had now replaced the earlier clouds. Crossing the Rochester Way the route then heads into Shepherdleas Wood. Here the path meanders its way through the trees to reach a Green Chain Walk mileage post. 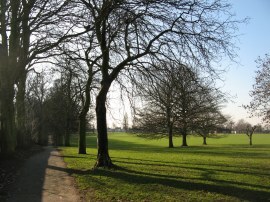 This rather isolated spot marks the point where stage 7 of the Green Chain Walk starts, continuing ahead along a path through the trees which heads up to Avery Park via Falconwood, while stage 6 heads off along a path to the right that heads through the trees to North Eltham Park. 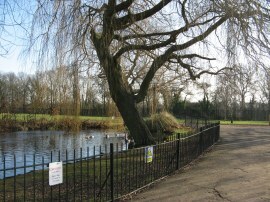 Leaving the trees, the Green Chain Walk heads across an open area with a pond on the left, photo 2. Shortly after the pond the path reaches a black metal fence where the route heads to the left along a path that runs parallel with the A2 Rochester Relief Road. Leaving the tarmac the path heads into a band of trees before turning to the right across a broad footbridge that heads over some railway lines and the Rochester Relief Road into Eltham Park South were a sign says it was 8 miles from the Thames Barrier, photo 3. Here the Green Chain Walk continues ahead down the left hand side of the park before following the path round to the right along the bottom edge of the parkland, photo 4. 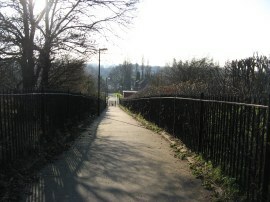 This long straight section of path is followed down to Glennis Road where the route heads to the left along the broad street which is lined by large detached houses. Reaching the end of the road the route heads straight across the A210 Bexley Road and down Butterfly Lane, a concrete track running behind house that leads to Eltham Sports Ground with paddocks on the left. Reaching the end of the track the path then bears to the right along a path that runs through some scrubby woodland at Conduit Meadows, soon passing a link path off to the left that joins up with route seven although I will save that stretch of the walk for when I am walking route seven. 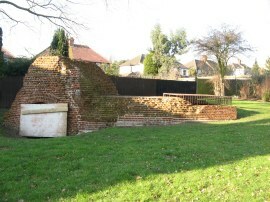 Leaving the trees the route passes by Conduit Head, photo 5, a brick built medieval structure that housed a weir that controlled the supply of water to the moat of Eltham Palace. Leaving this the green Chain Walk joins a short length of fence lined path which leads down to Southend Crescent where the route heads to the left. Reaching a small roundabout the route continues ahead a short distance down Footscray Road to reach a zebra crossing which is used to cross the road before heading back up to the right and then bearing to the left along Footscray Road. This is followed uphill as the road bends round to the left. 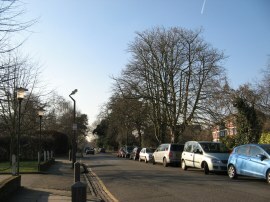 The route then joins another suburban street, North Park, on the left, photo 6. 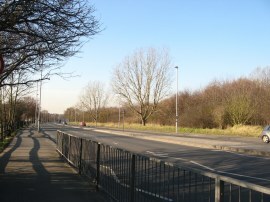 This long straight stretch of road is followed for some distance to the end of the road the route crosses over the A208 Court Road and continues ahead down Tilt Yard Approach, alongside a tall red brick wall on the left hand side. Reaching the end of this turns the route heads to the left along a short stretch of road which leads to the entrance of Eltham Palace. At the gates to the Palace the route then heads to the right along St John Walks which bears to the right around the grounds of the palace, photo 7. Once again it had proved very difficult to photograph with the sun almost directly behind it. 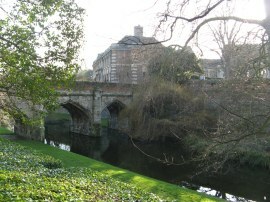 The current buildings were built by Courtauld family next to the remains of Eltham Palace of which only the Great Hall, built in the 1470's, survives. Reaching a crossing path the route heads to the left along a broad tarmac path which runs between fields below the grounds of Eltham Palace. This path runs between the fields, heading ever so gently uphill from where there were excellent views across London, from the transmitter tower at Crystal Palace round past Docklands, photo 8, to the flatlands of Essex. 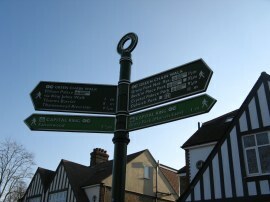 Continuing on the path then passes the end point of stage seven on the left before continuing on heading downhill along King Johns Walk, photo 9. Reaching the end of King Johns Walk the route crosses Middle Park Avenue and continues ahead along a path that runs between houses to reach a footbridge over railway lines. Lying on the ground at the top of the bridge was a plastic folder containing printouts of the Walk London route description for the stage of Green Chain Walk which must have been dropped by another recent walker along the path. Once over the railway lines a short stretch of path leads down to a pedestrian crossing over the busy A20 road, photo 10. Once over the road a short stretch of footpath heads up between houses to reach Mottingham Lane, photo 11, which marks the end of stage 6 of the Green Chain Walk. This location also marks the start points for both route 8 and route 9a and thus is another place I will be returning to soon however for now I headed to the left down the road as I made my way towards Mottingham Station, photo 12, to start my journey home. Reaching Mottingham Lane I had walked 3.59 miles from the start point in Oxleas Wood. From Mottingham Lane I headed along Mottingham Road and then up West Park to the Sidcup Road. 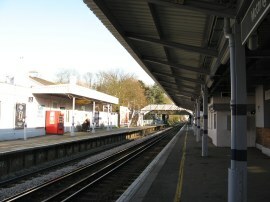 Here I headed to the right before turning to the left down Court Road to reach Mottingham Station from where I caught the train home having walked a total distance of 13.0 miles for the day.